The doctor-patient relationship is critical in health care, and good relationships are linked to better health outcomes and treatment adherence (Berry et al. 2008; Haskard-Zolnierek and DiMatteo 2009; Safran et al. 1998; Stewart 1995; Thom, Hall, and Pawlson 2004). Patient-provider relationships among people who struggle to afford health care have room for improvement: low-income adults are less likely than higher-income adults to report high trust in their providers (Long and Bart 2017a), and only about one in four adults with unmet need for health care because of affordability problems are asked by their provider if they have concerns about health care costs (Long and Bart 2017b). The lack of trust and dialogue is troubling because affordability problems can cause patients to forgo needed care, putting their health at risk. This QuickTake uses data from the September 2016 Health Reform Monitoring Survey (HRMS)1 to explore patientsâ€™ trust in their providerâ€™s ability to tell them about the potential costs of different health care treatment options. 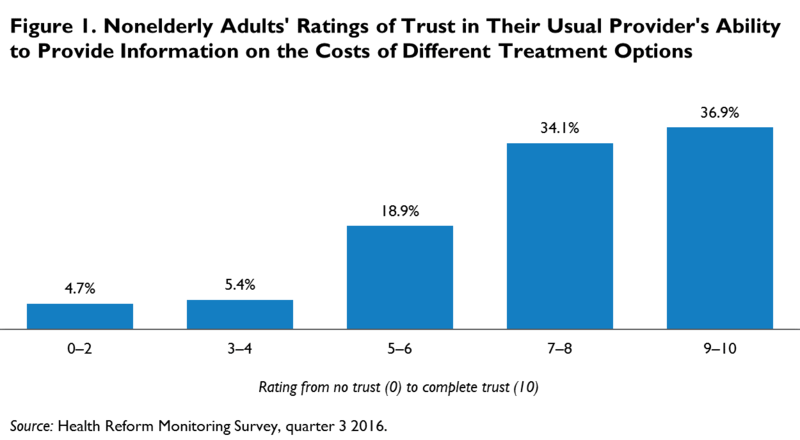 In general, adults gave high ratings of trust in their usual providerâ€™s ability to tell them about the costs of different treatment options. The median rating category was 7â€“8 on the 0 to 10 scale, with 36.9 percent of adults giving ratings of 9 or 10, and less than 20 percent giving ratings in the middle of the scale, at 5 or 6 (figure 1). Approximately 10 percent of adults gave low ratings from 0 to 4. Trust in provider ability to discuss health care costs varied by subgroup. 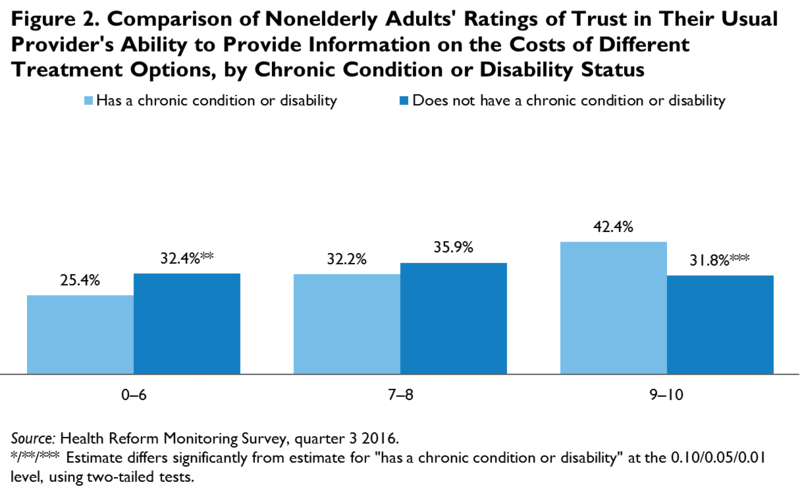 Adults with a chronic condition or disability were more likely than healthier adults to give trust ratings of 9 or 10 (42.4 percent versus 31.8 percent; figure 2); this may reflect stronger patient-provider relationships among adults with health problems. 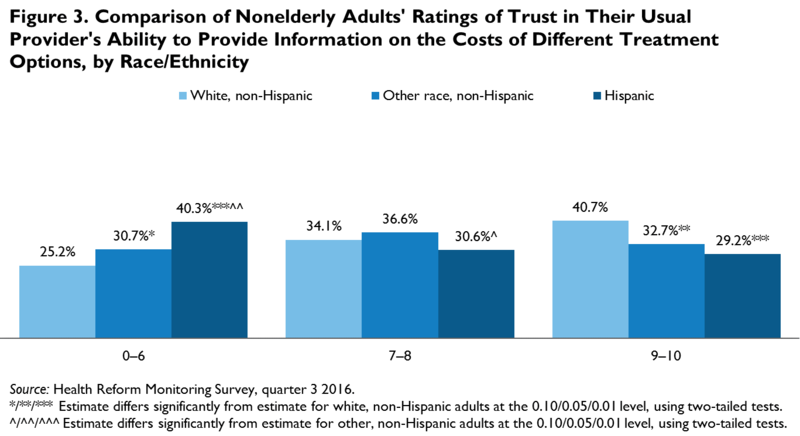 Adults who belong to a racial or ethnic minority were less likely than white, non-Hispanic adults to rate their trust in their provider a 9 or 10: 40.7 percent of white, non-Hispanic adults gave a rating of 9 or 10, compared with 32.7 percent of nonwhite, non-Hispanic adults and 29.2 percent of Hispanic adults (figure 3). Lower-income adults tended to have less faith in their providerâ€™s ability to discuss the costs of different treatment options. 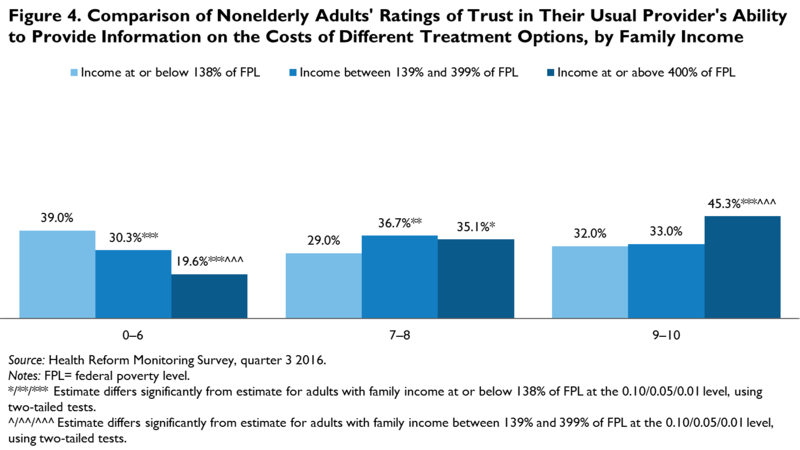 Only about one-third of adults with low and moderate family incomes reported high trust in their providerâ€™s ability to speak on such matters, compared with 45.3 percent of adults with incomes at or above 400 percent of the federal poverty level (FPL; figure 4). Similarly, only 28.4 percent of adults who reported going without needed care because they could not afford it rated their providerâ€™s ability to discuss treatment costs a 9 or 10, compared with 39.8 percent of other adults (figure 5). Lower-income adults and adults who have forgone needed care because they couldnâ€™t afford it are likely to be more sensitive to the costs of health care, yet our analysis shows that many of them do not fully trust their providers to discuss these problems. These groups have much to gain from patient-provider relationships that include open, honest discussions about the costs of health care. Berry, Leonard L., Janet Turner Parish, Ramkumar Janakiraman, Lee Ogburn-Russell, Glen R. Couchman, William L. Rayburn, and Jedidiah Grisel. 2008. “Patientsâ€™ Commitment to Their Primary Physician and Why It Matters.” Annals of Family Medicine 6 (1): 6–13. doi:10.1370/afm.757. Haskard-Zolnierek, Kelly B., and M. Robin DiMatteo. 2009. “Physician Communication and Patient Adherence to Treatment: A Meta-analysis.” Medical Care 47 (8): 826–34. Long, Sharon K., and Lea Bart. 2017a. “Do Patients Trust Their Providers?” Washington, DC: Urban Institute. ———. 2017b. “Patients Feel Comfortable Talking to Their Providers about Sensitive Issues, but Providers Donâ€™t Often Ask.” Washington, DC: Urban Institute. Stewart, Moira A. 1995. “Effective Physician-Patient Communication and Health Outcomes: A Review.” Canadian Medical Association Journal 152 (9): 1423–33. Thom, David H., Mark A. Hall, and L. Gregory Pawlson. 2004. “Measuring Patientsâ€™ Trust in Physicians When Assessing Quality of Care.” Health Affairs 23 (4): 124–32.